Mineral Life: As a result of a freak accident, Baker was transformed into living sand. The sand functions identically to, and appears to be, normal flesh. 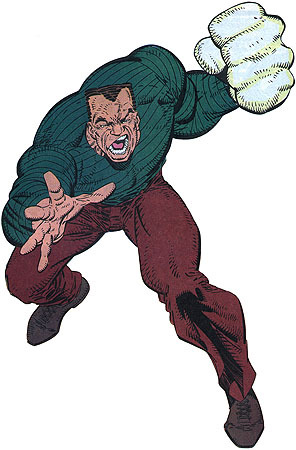 However, Sandman can at will convert parts of his body into animated sand. He has used this ability to form hammers and cages, elongate parts of his body, phase through small openings and fire Sandblasts. Body Armour: Sandman’s altered body provides him with protection from physical and energy attacks. Molecular Conversion: Sandman has the ability to convert normal sand into the special type that forms his body. In doing so he can heal himself and does not have to worry about being whittled away to nothing. A former prisoner at the Maximum Security Island Prison he was one of the most incorrigible prisoners. Then one night he managed to escape through an unguarded drainage tunnel. Vowing never to be captured alive he headed the F.B.I. list of most wanted criminals as he managed to stay one step ahead of the pursuing lawmen. But as the police dragnet drew ever tighter, he hid in the one place where no one would imagine a man would hide. An Atomic Devices Testing Centre. Realising it was the only place where he could have a measure of safety, he remained on the lonely, forbidden area beach. Until the fateful day that a Nuclear test explosion caught him unawares. By some incredible accident, the molecules of his body merged at that radioactive instant with the molecules of the sand under his feet. In doing so his body took on the qualities of the sand itself. He became the Sandman who is virtually indestructible.